Hair loss can be a very emotionally concerning cosmetic issues that can happen to both men and women. For those that are looking to reverse the effects of hair loss, PRP therapy is a non-surgical, safe and effective treatment option. The staff at Austin Med Spa has been trained by the world renowned expert in PRP Hair Resotoration, Dr. Jeffery Rapaport. He is currently Emeritus Chief of Dermatology at Holy Name Hospital and has one of the largest PRP practices in the country. Dr. Rapaport has been featured as an expert on many national media outlets discussing PRP Therapy, such as Good Morning America and The Doctors. Austin Med Spa believes that being trained by the best in our industry is key to providing the safest and most effective treatments outcomes. 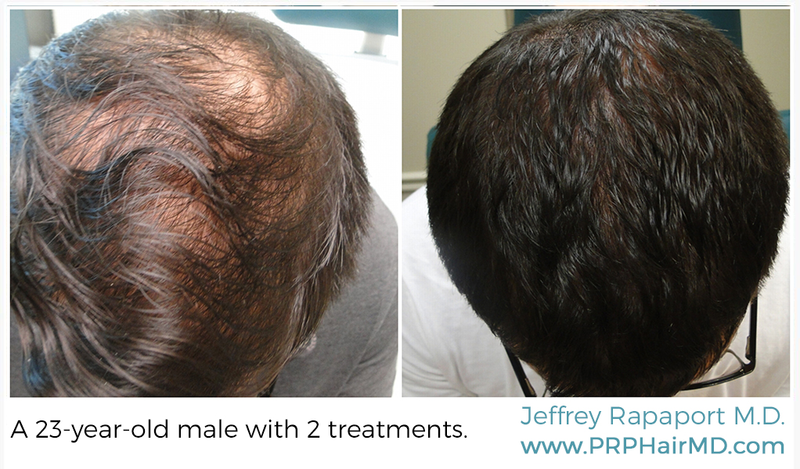 PRP is a very promising non-surgical treatment option for patients suffering with hair loss. PRP Therapy works on the basis of restoring growth factors within the blood. Human blood contains mesenchymal stem cells and autologous blood products that contain essential and specific growth factors that assist in tissue regeneration and healing. Once the scalp tissue is regenerated, the hair follicles are able to produce the necessary hair growth and in some cases the hair will grow back darker and thicker than before. In terms of the safety of this product, PRP has been the topic of medical literature form both the United States and Europe. Not only is the product heralded as a revolutionary way to stimulate and restore hair growth, but it is also one safest cosmetic hair growth options on the market today. While there is a prevalent opinion of PRP and its benefits within medical literature, you should also keep in mind that publications within literature do not mean that the product has gained FDA approval. PRP has been used for over 20 years for skin and wound healing. Doctors have been getting positive and successful outcomes in the areas of oral surgery, neurosurgery, plastic and cosmetic surgery, sports medicine and orthopedics. PRP is in it’s early stages of scientific research and subsequent FDA approval for hair restoration. It is not meant to replace the current FDA approved options such as DHT blockers (example: Propecia) and Minoxidil. The procedure is convenient and non-invasive. To begin, our medical staff will draw your blood in our office as though you are having routine blood testing. Afterwards, your blood will be spun the blood through a centrifuge and the PRP is separated and extracted from the rest of the blood using a highly advanced gel technology to get the highest level of platelets rich plasma about 3-5x the normal blood values. The second step requires that you be under topical anesthesia. Next, a medical practitioner will inject your scalp with the platelet rich plasma (PRP). The PRP stimulates the follicles so that your hair can regrow. There is a small amount of lidocaine added to the PRP for comfort during the procedure. We recommend about 4 PRP treatments performed monthly and then have one maintenance treatment done every 6 months to ensure that the hair follicles remain stimulated and that the hair growth is progressing as it should be. We also recommend a warm shower with gentle massage the night of the treatment. No sedation or any medication is necessary before or after the procedure. What is the science of PRP? Platelet rich plasma, PRP, contains platelets that are key to stimulating hair follicles to generate hair growth by stimulating the stem cells and other cells in the hair follicle microenvironment. . These platelets promote healing and the formation of new cell growth and accelerate the rate and degree of tissue regeneration. PRP is an ideal for hair restoration because it is highly effective in stimulating inactive hair follicles to revert to the active growth phase. There are many intracellular structures inside platelets such as glycogen, lysosomes and alpha granules. These granules contain clotting and growth factors that are released during the healing and repair process. Out of all of the products on the market today for hair growth, PRP is probably the most effective. As with any treatment, results are going to vary from person to person and there is never any guarantee of success. Overall though, PRP is an effective non-surgical procedure that works well to stimulate the follicle in order to induce hair growth, reverse hair thinning and in some cases can help the hair to grow back thicker and darker. Who are candidates for PRP? The best candidates for PRP treatment are those that have androgenic alopecia and do not have a history of scarring alopecia or alopecia areata which is a type of hair loss that occurs when your immune system mistakenly attacks hair follicles , which is where hair growth begins. PRP therapy can enhance the effectiveness and success of hair growth for surgical hair transplant patients or can offer an effective opportunity for hair growth for those patients who are not candidates or do not wish to have surgical hair transplantation. Patients with history of heavy smoking, drug and alcohol use, medical diagnosis such as platelet dysfunction syndromes, thrombocytopenias, hypofibrinogenaemia, hemodynamic instability, sepsis, acute and chronic Infections, chronic liver disease, anti-coagulation therapy, chronic skin diseases or cancer, metabolic and systemic disorders are also not good candidates. PRP has been used safely and successfully in other medical and surgical disciplines for many years. PRP is safe and natural because the procedure concentrates your own PRP that are not modified or changed directly back into the area of the scalp where it is needed. There is absolutely no chance of getting a blood infection from another human being. PRP should not be considered a “cure” for hair loss and no guarantee of success can be made, as patients results will vary.